Can you put glass in the oven? Yes, you can, if it has been labeled as oven-safe. Placing glass that is not oven-safe or heat resistant inside the oven can cause it to break or explode. Glassware meant to be used inside the oven is made from specially formulated glass or tempered glass that can withstand high temperature. Never should you use an ordinary piece of glass like a glass plate or glass serving plate inside the oven. 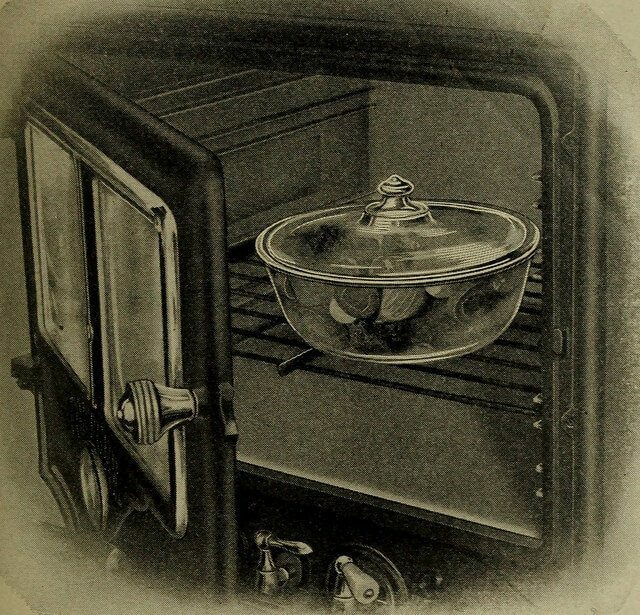 Most manufacturers place labels (usually found at the back) on glass indicating that it is oven-safe to eliminate the guesswork. If the glass plate or casserole does not come with an oven-safe label the safest way to go is not to place it inside the oven. These are usually the vintage, antique or handmade glass as well as ordinary glassware. Never allow the oven-safe glass to get into direct contact with a heating element (burner or stovetop burner). Never place oven-safe glassware in an oven toaster, grill or barbecue. Never use oven-safe glass in a broiler. Follow the manufacturer’s guide on the temperature limit inside the oven. Keep in mind these precautions to keep your glassware from cracking, chipping or breaking. Thermal shock occurs when the glass is subjected to sudden and significant changes in temperature even when oven safe or resistant to heat. Prevent oven-proof glass from getting in contact with water while still hot. Never pour cold liquids into hot glassware. Avoid placing hot glassware from the oven onto granite countertops. Place it atop a dry hot pad, pot holder or towel. Never place glassware directly from the freezer to a pre-heated oven. Avoid placing hot glass into the dishwasher. These scenarios will cause the glass to break even if it is oven-safe. Most manufacturers recommend not heating oven-safe glass higher than 3500F. It is also recommended that you reduce the temperature by 250 10 minutes before the cooking time is over and check for doneness. It can take some time for glass to heat up but when it does it will get to be very hot. When hot, glass does not quickly cool. While still hot prevent any liquid from getting into direct contact with glassware. Glassware with a chip or scratch will tend to expand when inside the oven and will eventually break with all your food splattering inside your oven. Even without noticeable cracks, chips or scratches, glassware that has been struck heavily by cooking utensils, bumped or dropped will cause it to weaken and break while heating inside the oven. It is best to discard glassware that has been subjected to these kinds of torture. Can you put glass in the oven? Of course, you can as long as they are labeled as oven-safe and necessary precautionary measures are followed.